Dr. Aman Mangat graduated from the Faculty of Dentistry at the University of Toronto and joined Dr. Montague’s dental practice in 2006. He is a member of the Toronto Central Dental Society, Toronto Aesthetic and Implant Association, the International Congress of of Oral Implantologists, the Ontario Dental Association, the Spear Continuing Dental Education seminars and a member in good standing with the Royal College of Dental Surgeons. 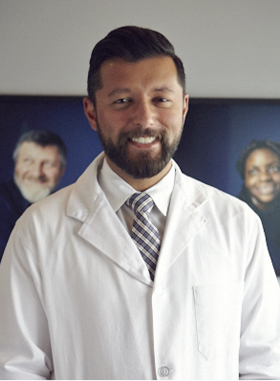 In order to give back to his alma mater, and keep involved in the educational experience of dental students, he also regularly participates in mentorship and serves as a clinical instructor at programs with dental faculty at the University of Toronto. All this is to say, he values quality, continuous education and experience in order to deliver exemplary patient centred care. Dr. Mangat shares Dr. Montague’s love and respect of people as well as his philosophy regarding the overall care of his patients. This involves drawing the patient themselves into having a confident, ever-evolving relationship with their mouth and themselves. A welcoming, caring attitude coupled with open communication with every patient allows him to make your long-term oral health goals our priority.